On 21st October 2016, 11 Officers from the Gurkha Brigade Association will undertake a gruelling 24-hour challenge in Nepal to raise money for the Gurkha Welfare Trust. The task they have set themselves will take a huge personal and team effort and the Officers will have to dig deep to achieve their aim. 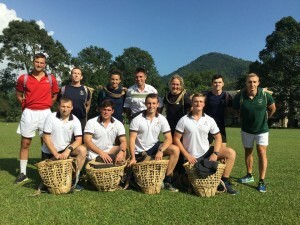 The team will first complete the iconic Gurkha Doko Race, and if this was not enough and with very little rest they will dust off and head out on an incredible 50km ultra marathon across the Annapurna trail. Mount Annapurna is situated North of Pokhara Valley in Nepal. Mt. Annapurna Marathon was named after a mountain peak called Mt. Annapurna I (8091m), starts from the East Face altitude of 4395m. The Marathon is organized to celebrate the first successful ascent on 8000m peak (Mt. Annapurna) by the French Team led by Maurice Herzog on 3rd June 1950. Mt. Annapurna Marathon is a tribute to Late Dr. Harka Bahadur Gurung, who was the first Tourism Minister of Nepal and an expert on mountain tourism. Dr. Gurung made a tremendous contribution to the development of Nepalese Tourism under his visionary leadership as Tourism Minister of Nepal. Lieutenant Scott Sears said; “After hearing stories of the incredible work done by Lieutenant Colonel John White MBE and the Earthquake Response Team, as well as the endless efforts by all members of Gurkha Welfare Trust, we felt we needed to do something to contribute to their efforts. Please join us in wishing them well on their extraordinary endeavour.